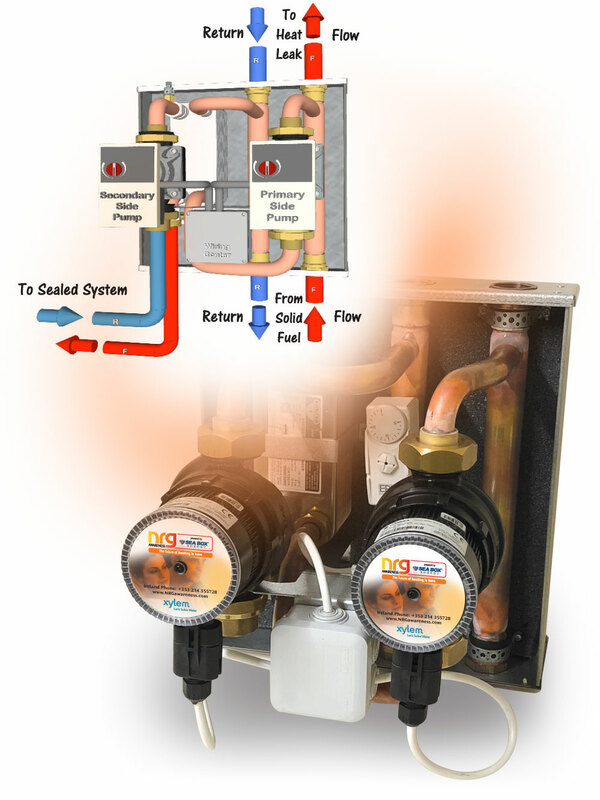 The NRG Link is a very simple yet highly effective system inter-linking solution from NRG Awareness, used to interconnect open solid fuel systems to sealed heating systems in a patented and uniquely safe way. NRG Link provides for an onobstructed gravity heat leak circuit from a solid fuel appliance that incorporates an open expansion and cold feed to take the heat from the solid fuel appliance into the sealed system. The unit is completely insulated with pre-wired primary and secondary side pumps which are controlled by an integral thermostat, and plate heat exchanger all neatly packaged in a 320mm x 330mm x 350mm, including pre-insulated enclosure. NRG Link is compliant with all solid fuel regulations with flow and return connections for the solid fuel appliance, a heat leak circuit and an efficient heat transfer medium to the sealed system.